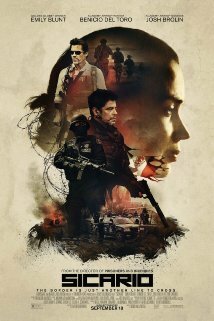 Sicario (Spanish for 'hitman') was actually the last film that I was able to see in a theater. Oddly enough I watched it the afternoon after my last review was posted (my wife and I have since seen a handful of other films via Redbox/Netflix, reviews of which will hopefully be posted later today). Anyway, Sicario focuses on up-and-coming FBI agent Kate Macer (Emily Blunt) and her efforts to combat the war on drugs. Director Denis Villenueve doesn't waste any time setting the tone for the film, opening with a raid led by Macer that uncovers a bit more than expected - bodies in walls and a booby-trapped shed that kills a couple of agents. We then see Macer and her partner Reggie Wayne (Daniel Kaluuya) waiting outside a conference of high ranking officials. The two believe they are going to be reprimanded for the unfortunate events, but instead Macer is recruited to help with a government task force with greater reach and fewer restrictions than the unit she currently helms. Thinking that it will afford her the opportunity to make a real difference she accepts and is quickly thrust into an investigation in which she is kept at arms reach and is provided intel only on a 'need to know' basis. As she slowly learns more about the way her new task force operates, she begins to question whether or not they are making the impact she originally envisioned, and if they are, if their methods are truly worth it. This film has two strengths: the cast and the way in which the story is presented by Villeneuve. Blunt is excellent as she usually is, and Josh Brolin (Matt Graver) and Benicio Del Toro (Alejandro) add a smug and brutally honest, yet not-so-forthcoming tone to the task force that Macer joins. Victor Garber (Dave Jennings), Jon Bernthal (Ted), and Jeffrey Donovan (Steve Forsing) add familiar faces to the cast but also excel in their small roles that have an impact on the story. As for Villeneuve's direction, he rolls the story out in a way that keeps the viewer just as much in the dark as to what is going on as Macer is. You may recognize Villeneuve's name if you've seen Prisoners (2013), an equally suspenseful thriller that starred Hugh Jackman and Jake Gyllenhaal. Villeneuve also engineers a nice twist three quarters of the way through the film that calls into question methods that may be employed by our government's agencies. If you're into suspenseful crime thrillers, Sicario is definitely a film that you should check out. Unfortunately, if you haven't yet seen it, you'll probably have to wait for the home video release as it has cycled out of most theaters at this point.